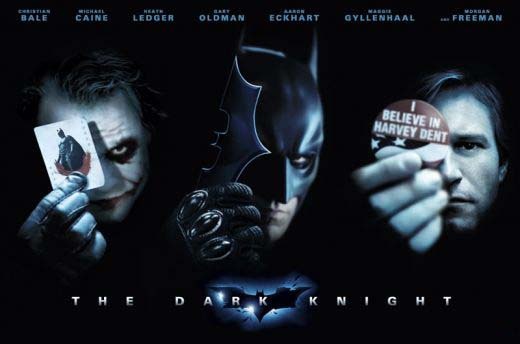 If you haven't seen The Dark Knight yet, what are you waiting for? See it in iMax. If you have seen The Dark Knight but not the iMax version, see it again in the iMax format. This highly acclaimed film has exceeded all existing iMax receipt records. Batman #6 as a smash iMax presentation has raised the bar for all genres of film that follow. The larger than life screen is simply overwhelming and embellishes the overall impression that this film establishes with audiences of all ages. WOW is the best word to describe the iMax experience. The chitter chatter over Heath Ledger's performance as The Joker would have been the big buzz about this cinematic titan even if he had not passed away prematurely. Delivering a convincing portrayal of The Joker as a mad mass murderer and not a cartoon clown was key to his success. Ledger mildly eclipses Christian Bale's caped crusading Batman. But by comparison, The Batman is dark and thrives in the shadows. He growls to instill fear. The Joker is bright and colorful, wearing war paint to promote terror. His actions are exaggerated and deliberate, executed in grand fashion to maximize impact. If The Joker did not supersede The Batman on the attention level meter, it's possible the movie may have suffered critical disappointment. The Joker reigns as the top leading criminal character in the comic book universe, trumping all other evil villains that ever challenged a superhero. Batman's campaign to crush criminal activity plaguing Gotham City is complicated by distractions created first by The Scarecrow and later by Two Face. Lieutenant James Gordon fiercely pursues the evasive mob figures, and District Attorney Harvey Dent gambles on a dangerous ploy to draw the fire of The Joker. The main event is the magnificent showdown between the avenger and the clown, erupting on the streets of Gotham City. Then, our protagonist and antagonist face off together in the interrogation room. Fearlessly, The Joker withstands an intense encounter with Batman while weaving his web of deadly deceit. You will believe in The Dark Knight. Bale and Ledger are supported by a stellar cast: Michael Caine, Aaron Eckhart, Morgan Freeman, Maggie Gyllenhaal, and Gary Oldham to name a few. The question now is how are they going to produce a satisfying sequel for the next Batflick? Robin Williams would be tremendous as The Riddller.